Adventures in the Endless Pursuit of Entertainment: Modern Tonic: A Shrekariffic Contest! Modern Tonic: A Shrekariffic Contest! 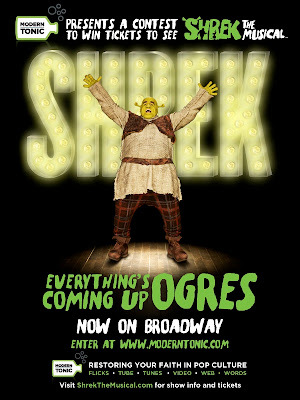 Modern Tonic, the website that "restores your faith in pop culture," is offering a chance to win a pair of tickets to see Shrek the Musical now playing on Broadway. All you have to do register at Modern Tonic and submit "a snappy caption for the show’s ad campaign, which lampoons Broadway faves." It's Shrektastic!